In the Arizona Fall League, Ryan McKenna , Tyler Erwin , Steve Wilkerson , Tanner Chleborad , Chris Lee and Jay Flaa are all playing for the Glendale Desert Dogs. Regarded as a "finishing school" for some of Minor League Baseball's top prospects, the AFL is comprised of six teams and includes prospects from all 30 MLB organizations. The Desert Dogs roster includes players from the Orioles, White Sox, Indians, Dodgers and Yankees organizations. 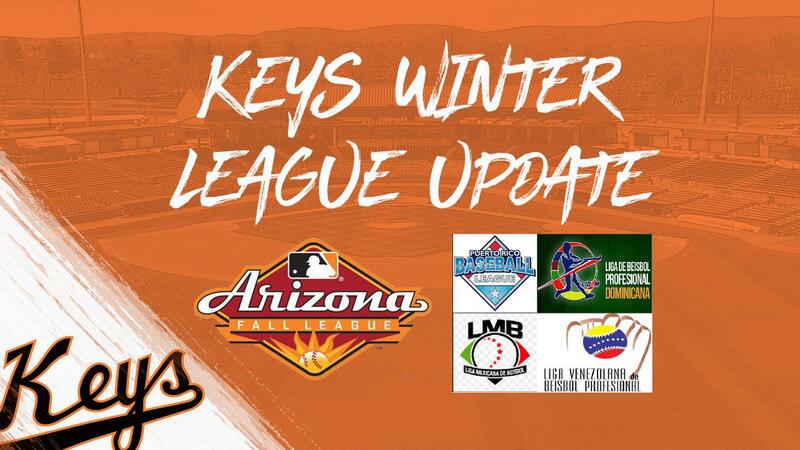 The team is managed by Orioles Minor League Infield Coordinator Dave Anderson, while former Keys coach (and now Dodgers Minor League hitting coach) Justin Viele , serves as one of the team's hitting coaches. Wilkerson has played in all five Desert Dogs games and is batting .308/.526/.538 with a 1.065 OPS in limited action. He is 4-for-13 with three doubles, an RBI and a run scored and has also walked six times while splitting time between second and third base. McKenna has also gotten off to a nice start, going 3-for-9 in his first three games with a triple, a double, four runs scored and four walks. During his time in Frederick, McKenna was among the MiLB leaders in hits, on-base percentage, bating average and runs scored. On the mound, Erwin, a 2018 Carolina League All-Star, has allowed one run on two hits in three innings. He has walked three and struck out five. Chleborad has surrendered one run on three hits in two innings and Flaa has tossed 2.1 scoreless innings. Lee made his first start last Thursday, tossing two clean innings of one-hit baseball (3BB/2 SO). Outside of the AFL, Wilson Garcia , Yojhan Quevedo and Erick Salcedo have all started play in the Venezuelan Winter League. A Carolina League Postseason All-Star, Garcia is 1-for-6 with two RBIs in his first two games for the Cardenales de Lara. In four games, Quevedo is batting .364 (4-for-11) with an RBI and run scored. A member of the Double-A Bowie Baysox the last two seasons after playing for the Keys in 2016, Salcedo is 0-for-3 in his lone game for the Tigres de Aragua.